TWB SA supplies low and medium voltage instrument transformers for indoor and outdoor use in the power industry. TWB uses outdoor Swiss made cycloaliphatic resin both for indoor and outdoor transformers. Cycloaliphatic resin has strong molecular bonds in comparison to epoxy resin and PU compounds, allowing for less maintenance and a long service life. It is also environmentally friendly and complies with registration, evaluation, authorisation and restriction of chemicals (REACH) regulations. To ensure the resin is homogenic, it is mixed and poured under a high-vacuum and then cured under pressure. In order to minimise the stress that the insulation is subjected to due to high electrical fields, both the high-voltage and low-voltage windings together with the magnetic core, are wrapped in a semi conductive shield and extra conductive meshes are installed peripherally in key positions. The insulation body on TWB’s outdoor transformers comes with double sheds to increase creepage distance, while the secondary box, manufactured from resin and fixed to the transformer’s body, offers IP 54 protection and an added grounding terminal. Many types of TWB’s indoor transformers are manufactured according to German standards DIN 42600. The secondary terminal box is sealed by a cover manufactured from self-extinguishing material (Makrolon). The windings’ terminals can be grounded directly with a screw that passes through the terminal and mounds to the transformer’s base. The removable terminal box cover can be sealed. TWB’s current transformers cores are manufactured from nickel steel or nanocrystal laminations and can conduct up to 3,000A and 120kA. 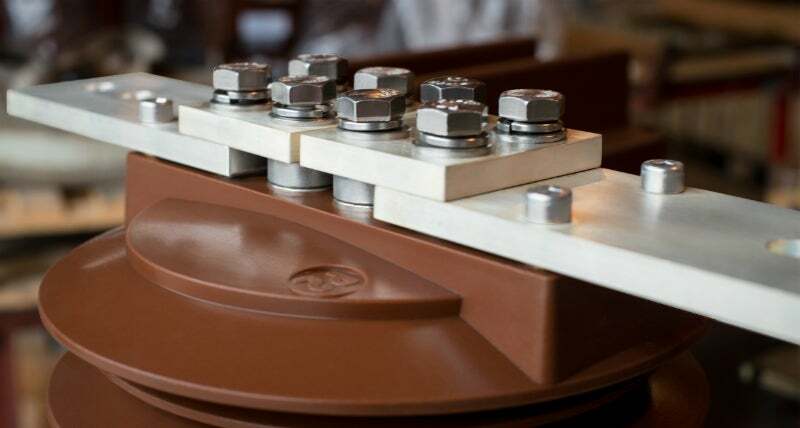 The company can supply integrated coupling electrodes and secondary tapings but initially transformers have single ratio or primary reconnection at a ratio of 1:2. Supporting type voltage transformers can contain up to three windings and up to five cores. Cores are made from high-quality siliceous steel. Extra open delta windings can be supplied if required. TWB also produces ‘railway type’ outdoor voltage transformers with a low-resistance shield. TWB SA offers metal clad medium voltage VT’s for indoor applications up to 24 kV. High conductivity material is applied with strong bonding for discharging the ionized air in medium voltage cabinets, for electromagnetic shielding and touch proved. TWB’s control power Voltage Transformers combine the attributes of an inductive voltage transformer with the application of a power transformer. Transformers with higher than 4kVA power outputs and special geometry, can be manufactured upon request. TWB SA offers all types of low-voltage instrument transformers for indoor, as well as for outdoor applications, according to IEC 61869-1. Transformers are window, wound or split core type and are either encapsulated by a high-grade self-extinguishing polycarbonate housing or are resin impregnated. TWB can manufacture any other special types upon request. TWB SA produces low-voltage meter junction terminal boxes, according to EN 60999 (IEC 999). All terminal boxes are CE certified. The manufacturing process for every product is electronically controlled and in compliance with EN ISO 9001 and EN ISO 14001. TWB regularly invests in new technologies to improve its production systems, resulting in improved lead times and competitive prices. Custom computer numerical control (CNC) machinery developed by TWB engineers are used in the manufacturing process, which includes resin impregnation plants and winding machines. Furthermore, TWB has developed laboratory equipment, standard transformers etc. All TWB products are tested rigorously, including an instrument transformer calculation programme and element analysis. TWB SA has been manufacturing transformers since 1971, operating under adverse conditions all over the world, from Canada to Australia, from Laos to Saudi Arabia. It’s long list of customers includes electrical companies, electrical cabinets developers and manufacturers of instrument transformers. All TWB products are type test certified according to IEC 61869 and designed to meet all international standards, including IEC, DIN, ANSI, BS, AS, VDE etc. TWB SA, a company with many decades of experience in the manufacturing of instrument transformers up to 36 kV, has developed a new series of Auxiliary Power Transformers for indoor applications, for operating voltage up to 20kV, secondary voltage up to 400 V and output power up to 10kVA. TWB SA designs, develops and manufactures, exclusively, dry-type low and medium voltage instrument transformers up to 36kV and 3000A, current and voltage, for indoor and outdoor applications.